Traveliving is out for more than a year. Digital version was published in April 2017 & the hardcopy came a bit later, in December of the same year. Talking about sales is a thing that always makes both author & publisher happy. No complaints about that in our case -even if we don’t have a publisher and we are not authors by profession but rather writers by heart. But what about real & unbiased reviews? How satisfied we are in this case? What people think about our book? But most important, what about people who come from the overland industry? What they have to say about Traveliving? How useful they find it for those who are looking for such a resource? “Traveliving is a word most contemporary adventurers have probably never heard. In fact, I had never heard it until Nikos Dimitriou reached out to me, asking me to look over his “romantic and practical guide” so titled. Once I had completed his book, not only had the term stuck but his reasons for putting the book together also sparked an intrigue many of us share as vehicle-based adventurers. Traveliving is not so much a story of “traveling” as it is a resource for guiding those who are searching for reason from the mundane and who feel compelled to leave the comforts of daily life for a life fully lived while on the road. For Dimitriou, this meant breaking free from a career in Logistics and Operations Management in 2012 and hitting the road with his life partner, Georgia, on a quest to experience as much of the world as possible. His book provides real-life experience and guidance on considerations to make when choosing to live a life on the road; however, it’s done in a way that’s charming and educational without going into so much detail that it becomes overwhelming. Dimitriou, who is Greek by birth, has now spent the past six years seeing the world, having traveled through 45 countries at the time of publication, guided by the following traveliving manifesto: “Live to Travel, not Travel to Live.” His perspectives are down to earth and whether you plan to leave your job and travel the world over or, like many of us, enjoy the freedom of several days in the backcountry, I’m confident you’ll not only enjoy Traveliving but may learn a thing or two about what makes vehicle-based adventure a worthwhile endeavor. OutdoorX4 Magazine (pronounced “outdoor by 4”) is a fully independent overland adventure lifestyle publication whose mission is not only on the mode of travel, whether a 4×4, motorcycle, bicycle, or by foot, as a means to responsibly enjoy outdoor recreation, but also on the adventures themselves, the people who live them, and working in solidarity with all outdoor recreationalists to ensure enjoyment of the great outdoors in ALL its forms is possible for current and future generations. 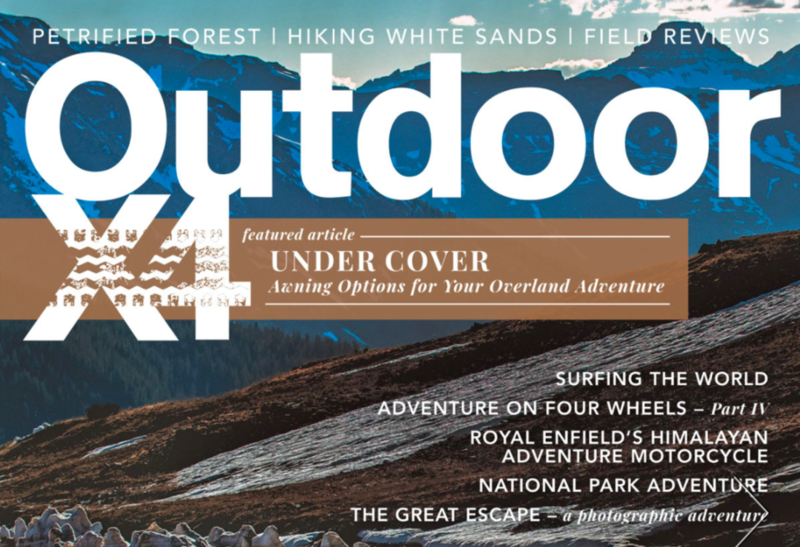 OutdoorX4 Magazine is the preeminent publication for responsible overland and adventure travel with family-friendly content that resonates with a broad audience of adventurers. The magazine is focused on the vehicle merely being a tool to get out and explore the natural world whether in a 4×4, on two wheels, or by foot. Additionally, their content is 100% unbiased with a focus on editorial driven by the thousands of adventurists who read and subscribe to OutdoorX4 Magazine. They never publish editorial paid for or influenced by outside companies, and they are committed to maintaining the highest level of editorial integrity. Now in its fifth year of publication, OutdoorX4 is offered six times annually in both an archival quality print edition as well as digital (HTML5) edition. The print book is available for purchase at most major newsstands, grocers and select pharmacies within the United States, Canada, and a myriad of retailers internationally. Both versions are available for domestic and international subscription with the digital HTML5 edition viewable on ALL devices equipped with a browser. It becomes more than obvious that this review put a great smile on our face & made us proud for our little travel publication which has been created as a tool to motivate people, provoke, inspire & assist with experience, information & little practical details all of those who are dreaming the great escape, the great trip, the great excuse for a serious life change. ⟵The Traveliving Series: Why All Overlanders Should Pay 5 EUR For Camping*?